Almost every month our favorite Wine bar and Bistro “Nectar” holds a wine dinner hosted by the winemaker or a representative of the winery and paired with Chef Kevin’s cuisine. This month, Nectar hosted a Rex Hill Wine Dinner. Being unfamiliar with a lot of wines from Oregon, I called right away and reserve a spot for Chris and me. We arrived at our normal time of 6:30pm. This time, we were seated towards the front by the table that Sam Tannahill and company would be sitting. Since we had about thirty minutes before the start of dinner we ordered a glass of Sangiovese from Peterson Winery. The dinner area was filling up quickly and shortly before 7pm Sam stood up and introduced himself and talked about the winery. He and his wife started in 2002 and are co-founders of A to Z Wineworks in Oregon. The first year that they released wine was 2006 with a production of 160K cases. To their surprise, they immediately sold out. I have to say that is a good problem to have! The following year they had the opportunity and purchased another winery Rex Hill, which was a 25-year-old winery at the northern tip of the Willamette Valley. After Sam’s brief introduction, he spoke about the first wine of the evening. It was the 2012 A to Z Riesling. The wine was just bottled and Sam suggested that we were probably the first customers to try the new release. He also mentioned that he felt that 2012 was a great vintage year for Oregon. Sweet citrus, pears, melons, lemon, bright. Also, floral notes and slightly sour. It was very aromatic. Buttery soft finish, light, not tart. It had a green apple finish (after you take a sip exhale from your mouth). 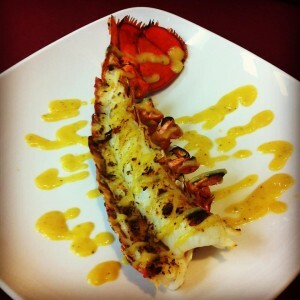 The Riesling was paired with a Grilled Lobster Tail and Green Curry Mango Sauce. The first course was excellent leaving me wanting more when it was gone. The Riesling cut right through the spice in the green curry sauce. Sam now was talking about the wine for the next course, which was a 2012 A to Z Rosé. The Rosé is a Sangiovese blended with Grenache and Syrah, but he did not mention the percentages of each. Tart and a bit like dirty laundry (Yes, it did smell like dirty laundry). I noted crisp Red Apple and Lemon. Soft with a short finish with nice acidity and a Cantelope finish. I could see drinking this Rose at the lake on a hot summer day! 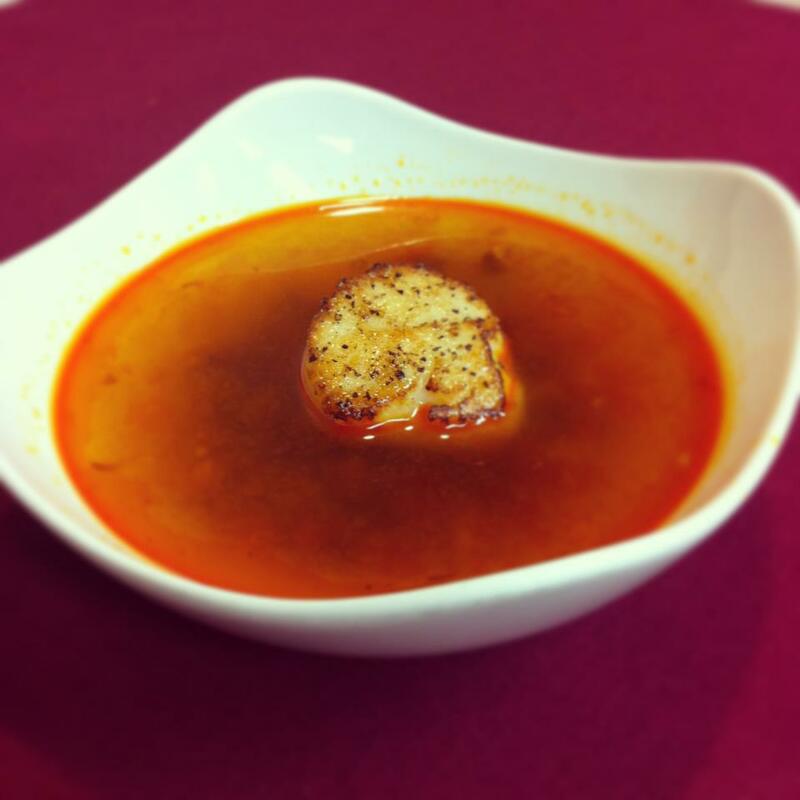 The Rose was paired with a wonderful Sea Scallop that was pan-seared and sat within a light Chorizo broth. It was served with a crostini and included little cubes of Chorizo, which tasted excellent! The scallop cooked was perfectly and the Rose was a great pairing! I was looking forward to the next wine and course. I was somewhat reserved about trying the Steelhead Trout because although I love to eat fish, I’ve encountered some bad experiences with Salmon. Sam introduced the 2009 Rex Hill Shea Pinot Noir, along with the 2010 Rex Hill Willamette Valley Pinot Noir for this course. Rex Hill winery started in 1992 and was purchased by the owners of A to Z in 2007. Sam explained that the staff initially was in disarray, but as time progressed they “clicked” by 2009. Since then the staff has been excellent! 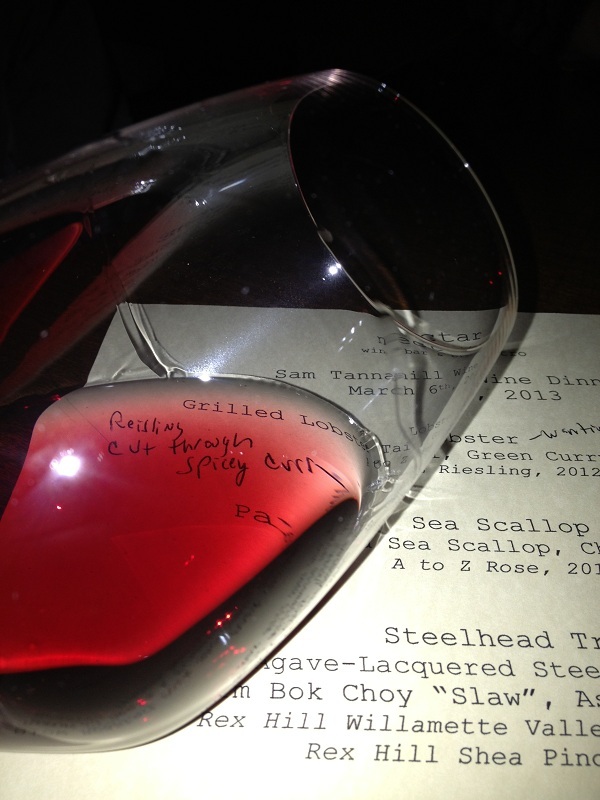 My notes for the 2009 Rex Hill Shea and 2010 Rex Hill Willamette Valley Pinots. Fruity, Cherry Pie, and Vanilla. Slightly earthy. Slightly tart, smokey, coffee, dark chocolate, earthy. Nice long finish. Earthy, ripe red fruit, smokey, funky smells. Smokey, butterscotch, earthy with a medium finish. I preferred the 2009 Rex Hill over 2010 if I had to choose one. The wine was excellent and so onto the Steelhead Trout. I was pleasantly surprised that the fish was mild and it was prepared perfectly! Each of the Pinot Noir’s both complimented the food just wonderfully! The final course included the 2009 Francis Tannahill Hermit Pinot Noir. This Pinot Noir was from the Dundy Hill AVA and we learned that Rex Hill only produced 240 cases of it. 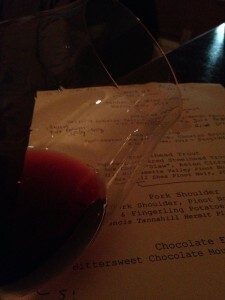 Sam told us that they dedicated the Pinot Noir “Hermit” to his first son. I rated this one 3 glasses. Slightly tart like the others. Earthy, dirty, smokey and funky. Tart with a dry finish. I was enjoying the wine so much with the Slow Roasted Pork Shoulder that I forgot to take additional notes. 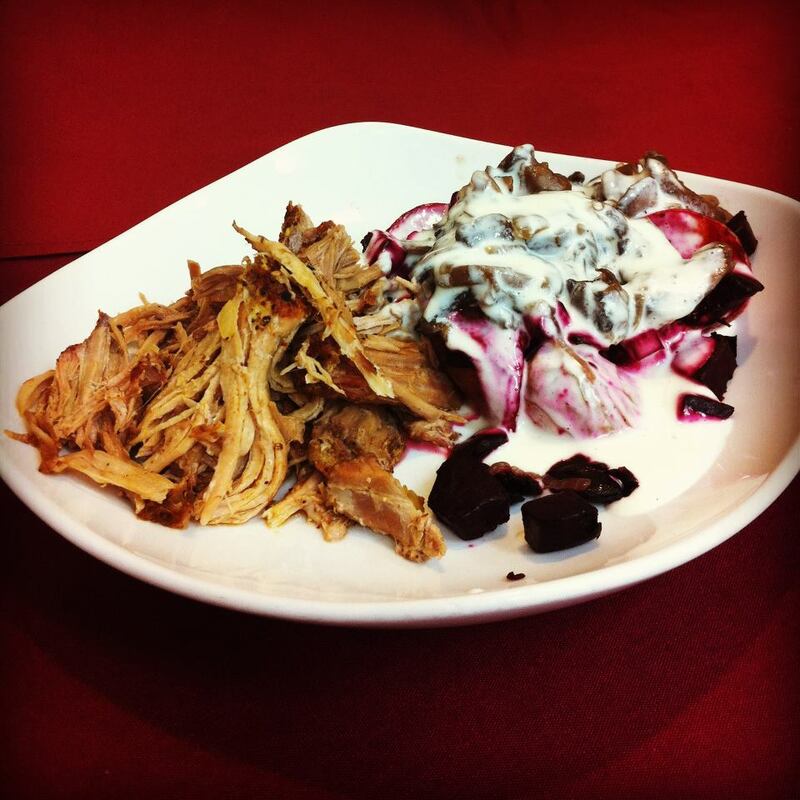 The Pork Shoulder was served along side of Pinot Noir Soaked Mushrooms, Roasted Beet, and fingerling Potatoes, covered with a Goat Cheese Fondue. This dish was excellent! Later that night Chris talked to Kevin about the recipe and I would love for her to try making the Fondue at home. The night ended with a Bittersweet Chocolate Mousse with sprinkled Smoked Sea Salt. The salty and sweet complimented each other and we shared it with a nice glass of Port! At the end of the night, Chris and I visited with Sam a bit. We complimented Sam on the wines and exchanged business cards. I see a future trip to Oregon to discover the many wines in that region! Kudos to Kevin and his staff. As usual, they did a superior job and I cannot wait for the next wine dinner.